What Benefits Do People Experience with Teeth Tomorrow? Every person with major dental problems is unique. However, they often have many things in common. They want to eat normally again. They want to stop endless trips to the dentist for treatments that don’t provide permanent relief. They want to smile and speak clearly. The Teeth Tomorrow® process delivers superior patient results by minimizing the stress that can accompany major dental work. First, all treatment is provided in one location. Second, our proven procedure means less chair time, more healing, less swelling, and far less discomfort. Third, and most importantly, Teeth Tomorrow Chattanooga is committed to providing every patient with the best possible care, clearly stated costs, and the experience and expertise to make every case a success. Teeth Tomorrow® implant bridges made from Prettau® Zirconia (the most durable dental material available) do not chip, crack, or stain like acrylic bridges with denture teeth. Prettau® Zirconia is non-porous with a high density, so it does not attract plaque or odors like acrylic. Teeth and gums are sculpted from one piece of zirconia, so there is no chance of individual teeth falling out or breaking. All Teeth Tomorrow® permanent implant bridges are designed and manufactured with state-of-the-art computer-assisted technology (CAD/CAM) at Tischler Dental Laboratory. They are precision-milled from a solid block of Prettau® Zirconia, then hand-finished to complement the patient’s unique facial characteristics. All Prettau® bridges carry a 5-year warranty against any type of failure. Every Teeth Tomorrow® Prettau® Zirconia bridge enables the patient to bite, chew, and speak without experiencing any shifting, slipping, or pain. Once the dentist and patient approve a 3-D computer image model, the bridge is customized and hand-finished to create a natural-looking smile that is virtually indistinguishable from healthy teeth and gums. Finished Prettau® Zirconia bridges resist the fading, staining, and discoloration associated with other dental materials. The state-of-the-art Teeth Tomorrow® Full-Arch Prettau® Zirconia bridge provides a permanent solution to major dental problems. It is anchored to a set of dental implants and never needs to be taken out by the patient. It looks like healthy teeth and gums and will not chip, crack or stain. Daily care consists of brushing (just like normal teeth) but there is no need to floss because it doesn’t attract plaque and the odors that come with it. It out-performs and out-lasts bridges made from plastic or a combination of acrylic and denture teeth. 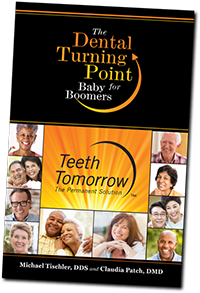 This ideal solution puts an end to the suffering that comes from living with missing, failing, decaying, and broken teeth. Is Teeth Tomorrow® the Right Choice for You? Ideal candidates for Teeth Tomorrow actively want to improve their quality of life and oral health through an attractive, permanent smile. Are you missing more than one tooth? Do you have multiple teeth that need to be extracted? Do you have broken or chipped teeth? Is eating painful? Do you avoid smiling? If you answered ‘Yes’ to any of these questions, Teeth Tomorrow may be right for you. If you are facing major restorative dental work, or have tried other options that failed, contact us at 706-259-3318.